as the Upper Green at Middleborough. Daniel Webster once described it as one of the finest churches he had ever seen. 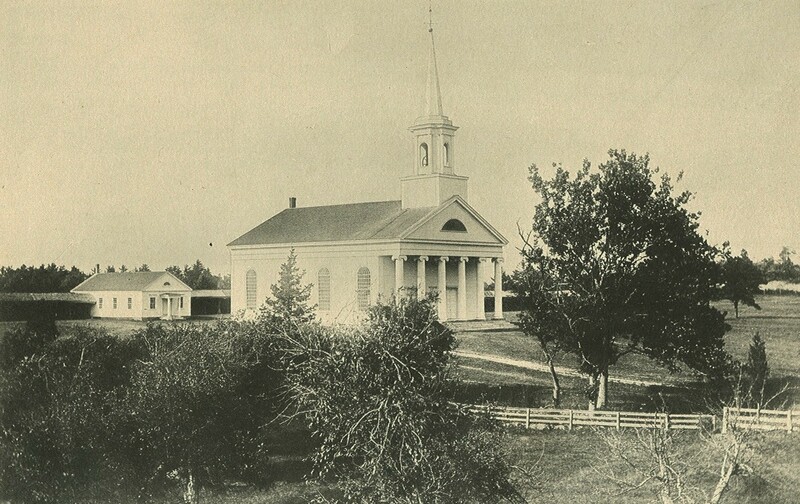 The 1828 First Congregational Church of Middleborough, better known as the Church of the Green, has since its construction become a local architectural icon, symbolic of the community’s religious heritage and life, and one much remarked upon for its beauty and setting. Discussion concerning a new church to replace the meetinghouse structure built in 1745, arose in 1827 if not earlier. The deteriorating condition of the 1745 meetinghouse led the First Precinct at its meeting of April 30, 1827, to consider whether to repair the building “so as to make it … more suitable for a place of public worship” or whether to build a completely new church. The meeting opted for the latter course of an entirely new church, voting “that it is the sense of the Precinct that they ought to have a New Meeting House”. A committee of nine consisting of George Eddy, William Bourne, James Sproat, Abiel Washburn, Cephas Thompson, Levi Tinkham, Thomas Sturtevant and Edward Sparrow was named to draft plans and report on the expense of the project. The committee reported back on October 11, 1827, estimating the cost of a replacement church at not more than $7,000 and “probably not more than six thousand five hundred dollars”. Two plans were suggested: one with a single gallery at the front of the church for singers and the second with the gallery for singers as well as narrow side galleries. The majority of committee members was in favor of the first plan. A committee of eleven was named to put the plan into effect and was comprised of James Sproat, Joshua Eddy Jr., Philander Washburn, Nelson Wood, Samuel Thompson, Gamaliel Rounseville, Edward Sparrow, Horace Tinkham, William Bourne, Cephas Thompson and Thomas Weston. The parish also voted that the chairman of this committee be authorized to act as the contracting agent. 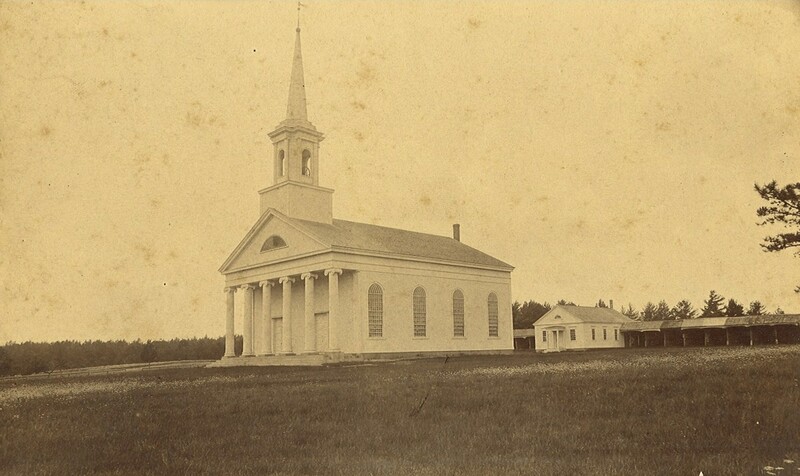 Whether there were second thoughts about constructing a new meetinghouse, or whether the precinct was simply considering the fate of its 1745 predecessor, on December 24, 1827, the precinct agreed by a vote of 62 to 30 not to repair the old meetinghouse. While preliminary work was being done on the design of the new church, the issue of a suitable site for it was also under consideration. The precinct, in December, 1827, authorized the building committee to act as a siting committee to select a suitable location for the proposed new meetinghouse, and four additional members were added for this purpose: Dr. Thomas Sturtevant, William S. Eddy, Silas Thomas and Eleazer Thomas. Having disposed of the time frame for construction, the committee next considered the church’s design. As noted previously, the committee had viewed a number of local churches built during the few years preceding and also “consulted the best architects in the Metropolis” (presumably Boston). The plan proposed by the committee called for a church measuring 66 by 62 feet. While the general details were indicated, specifics were not. “…Their extent [and] order is to be under the special direction of the chairman [James Sproat and] Mr. Cephas Thompson, two of [the] committee whose architectural skill and taste are such as most fully entitles them to the confidence of the precinct.” Sproat was noteworthy as a local architect of some stature, though little is known of his work today. Thompson, however, was more prominent, recognized nationally as a skilled portraitist whose artistic sensibility could be relied upon in the design and decoration of the church. Aware of the precinct’s earlier vote to include side galleries in the church, the committee once more recommended these features be eliminated following examination of recently-built churches as well as consultations with ecclesiastical architects. While the committee noted that “the general reason of this advice, the committee hope their chairman, will explain to the precinct to their full satisfaction.” The reasons for its opposition were not left on record and we may only speculate regarding the committee’s reasons, though by this time galleries were becoming a thing of the past. The parish heeded the call of the committee and accordingly voted to reconsider the matter of galleries. (They were never built). Regarding the location, the building committee had entered into negotiations in late 1827 and early 1828 with Lothrop Perkins, Esq., to purchase a 4-acre lot which stood on the so-called Upper Green on Plympton Street, adjoining the lot whereon stood the 1745 meetinghouse. At the time, a portion of the parcel was being leased by Perkins to others for the location of carriage sheds which undoubtedly served the nearby meetinghouse. The committee reported at the time “that after meeting and fully advising [and] considering the subject, it is their decided opinion that the new meeting house should be built on the land now owned by Mr. Lothrop Perkins, … four rods southwesterly of the place where the old meeting house now stands, the exact spot to be found by the same committee, thereafter” or by others. The lot recommended contained four acres, and the committee advised that it be purchased in its entirety “under the belief that the Precinct will need the whole for their full accommodation; [and] also believing that the vacant land Easterly of the old meeting house will soon be appropriated by the Precinct for a burial ground [and] if not the proprietors would purchase the same of the precinct at a price nearly equal to the sum to be paid by Mr. Perkins”. The committee was “confirmed in the expediency of the site recommended because the Green in front would greatly promote the requisite accommodations [and] because it is understood that a new highway is contemplated in the rear, near the northwesterly line of said Perkins lot.” The Perkins lot was duly acquired for $150 on May 6, 1828, though provision had to be made for those parties that had previously leased the ground for the private carriage sheds. It was at this meeting in April, 1828, that the matter of a vestry in the building was first raised. As the precinct would later find, the inclusion of a vestry would have provided a smaller meeting space for residents and church members which could have been heated much more economically and reserved the church proper strictly for religious use. However, after careful consideration, the precinct voted 31 to 17 against including a vestry in the church design. long since given place to more modern glass. shown to us that morning." Since the start of the new meetinghouse, one important consideration concerned compensation for the pew holders in the old meetinghouse. At the time, pews were held as personal property purchased at auction with title deeds documenting ownership. If the old meetinghouse was to be abandoned, pew holders would need to be monetarily compensated for the loss of their pew. The initial committee that was named to consider the design and expense of a new meetinghouse was also charged with addressing this matter and it reported in October, 1827, that $2,500 was adequate compensation to pew holders. Two months later, on December 24, 1827, the precinct voted that $1,000 was sufficient. To finance the cost of construction, the precinct voted to borrow money on credit. Ultimately, however, the construction of the new church was financed by the sale of the new pews there. 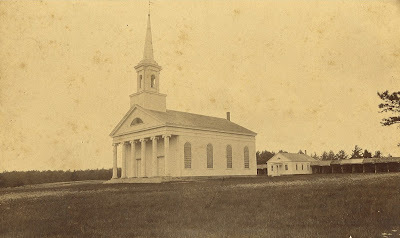 A year following, Charles Godfrey of Taunton, Nathan Kingman of North Bridgewater and Ezra Fobes of Bridgewater were named an impartial committee for the “appraisement” of the pews in both the old and new meetinghouses and the distribution of the $1,000 allotted to the holders of the old pews. Though the precinct had previously voted to finance the cost of construction of the new church through borrowing money on credit, ultimately the church was to be built with the monies received from the sale of the pews in the new church (minus the compensation to holders of pews in the old meetinghouse), The purpose, therefore, of assessing the pews in the new meetinghouse was so that a figure could be set which would both cover the expense of building the new meetinghouse as well as providing the $1,000 compensation to the old pew holders. The parish, however, voted that the $1000 offered for the old pews not be added to the cost of the new church, a step which was motivated strictly by financial self interest as including it would raise the final price of pews in the new church. Typically, the precinct had reserved a number of pews to itself, but in order to maximize the amount which would be realized from the sale of the pews, the precinct restricted itself to reserving only ten, and named Zachariah Eddy Esq., Thomas Weston Esq., Seth Miller Esq., Captain Samuel Thompson and Eleazer Thomas a committee to designate those pews. Holders of pews in the old meetinghouse successfully bidding on new pews were permitted to deduct the appraised value of the old from the expense of the new. Little is left on record concerning either the construction of the church or the pew auction, though its dedication was held on the first Tuesday of January, 1829, with appropriate ceremonies planned by Gamaliel Rounseville, William Bourne, Joshua Eddy Jr., Thomas Weston and Captain Samuel Thompson. Reverend Dr. Beecher, father of Henry Ward Beecher who would later attain greater prominence, gave the dedicatory sermon which was later published in pamphlet form. Following the completion of the church, the ground surrounding the structure was graded about May or June, 1829, the precinct soliciting volunteers for the purpose. A precautionary measure was taken when the parish voted to insure the new meetinghouse with the Bristol County Mutual Fire Insurance Co. against loss or damage by fire. The precinct further voted that in the event of a loss of the church by fire, the compensation received from the insurance company be used towards the construction of a new church “and that all Persons owning Pews in this Meeting House have pews alike situated in the Meeting House when rebuilt.” Fortunately, the church never needed to resort to this action , though fires during the mid-twentieth century at the Middleborough town dump (which occupied the site of the Middleborough Council on Aging on Plymouth Street) were potentially threatening. The fate of the 1745 meeting house was somewhat ironic and the failure to incorporate a vestry into the design of the 1828meetinghouse was responsible for a portion of its predecessor being preserved. The precinct ultimately sold the 1745 meetinghouse at public auction, but not before salvaging the “porch” and several windows for use in a new vestry building which was raised in 1829 behind the church, construction of which also utilized material left over from the building of the church. Since its completion and dedication in 1829, the Church of the Green has become one of Middleborough’s most historic and iconic architectural gems, recognizable to all with even but a fleeting acquaintance with Middleborough.